I seem to have a fondness for the less glamourous foods like ﻿kale﻿ and ﻿﻿beets﻿﻿. I think I feel a connection to them in someway, a little boring on the outside but in the right environment they can become the life of the party. Brussel sprouts I think have the worst reputation of all, we were taught to dislike them by our parents who told horror stories of being stuck at the dinner table until the mushy, slimy, and eventually cold brussel sprouts were gone. It took me well into my 20’s before I was even willing to entertain the idea of trying them and the first time I fixed them for my parents, well lets just say they were a bit skeptical. Visiting Alaina’s family for Thanksgiving one year they all raved about these brussels sprout with bacon that Lara made. I tentatively took a couple to try and by the time I realized how good they were the rest of the family had devoured all of them. I was hooked and convinced to try them further. Lara shared with me her secret to great brussel sprouts which is undoubtedly what was missing from our parents’ versions. One would think it was the bacon or the cream that she adds but really the trick is to remove the tough and bitter outer leaves. I’ve also found the fresher the better; the ones that can be found at your local farmers market will taste like sweet candy. While I love, and look forward to, the bacon and cream version for Thanksgiving each year my favorite way to prepare them came from Gourmet Magazine (RIP) in 2008. Sliced in half, and sauted in butter with carrots Alaina devours them with a little happy dance. If you try only one new recipe this Thanksgiving this should be the one. You and your dinner guest will thank me. Melt the 2 T. butter in a large skillet over medium heat. Add shallots and cook until softened 1-2 minutes. 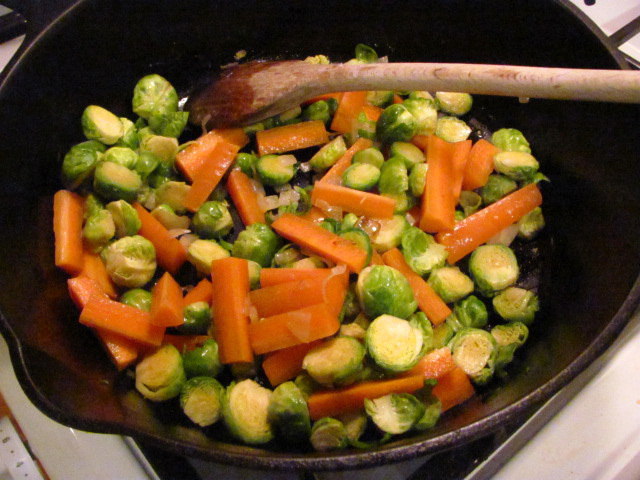 Add the carrots and brussels sprouts to the skillet, season with a bit of salt and pepper. Cook over medium-high heat for 3-4 minutes, stirring occasionaly, until the vegtibles begin to brown slightly. Add the water and cover the pan with a tight fitting lid. Cook, covered, for 5-8 minutes, until the vegetables are tender. 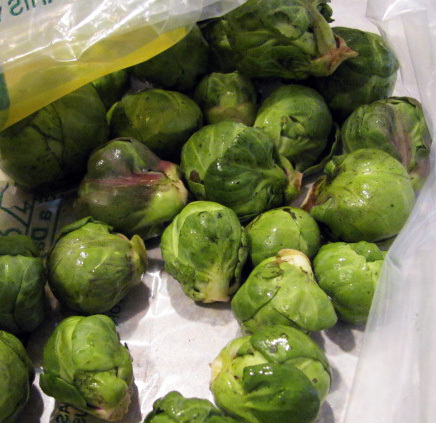 Do not over cook the brussels sprouts, they should be tender but still holding their shape, think al dente. Remove from heat and stir in vinegar, the residual heat in the pan will allow the vinegar to mellow and really bring out the sweet flavors. Toss with additional butter and season with salt and pepper. This entry was posted in Holiday, side dish, Vegetable, Winter and tagged Side Dish, Thanksgiving, Vegetable. Bookmark the permalink.